But for a chance phone call, Jennifer Dindinger may not have found her way to the Eastern Shore. She did a search for organizations working in both fields and stumbled upon the Harry R. Hughes Center for Agro-Ecology, based at the Wye Research and Education Center and part of the University of Maryland.In the spring, she cold-called them, as she had done to other places but without much luck. As it turned out, Russ Brinsfield answered the phone. The center’s director at the time did not typically answer the main line, but it was lunchtime and the receptionist was out, so this time he did. She told him who she was and what she wanted to do — and secured a six-month internship for the summer and fall of 2003. The next year, she graduated with a degree in environmental policy, and the Hughes Center hired her full-time in 2004, first as a research assistant and then as the communications and outreach coordinator. That proved to be a good segue into a career in extension work. 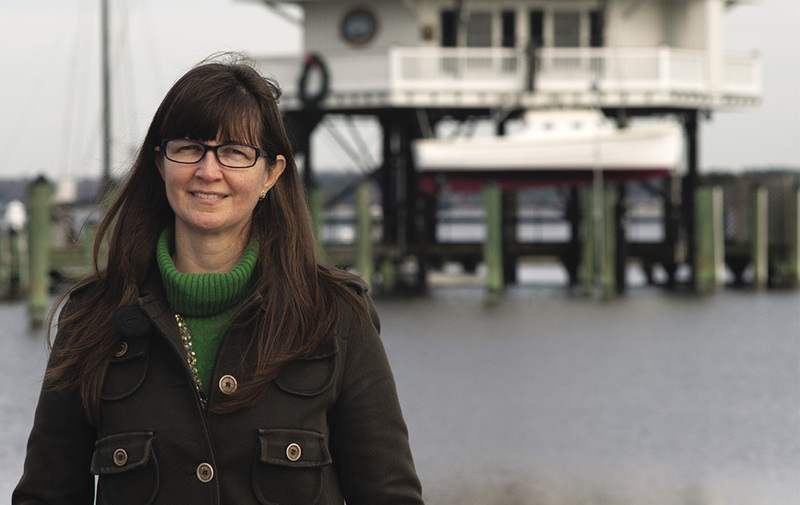 In 2009 while still at Wye, she joined Maryland Sea Grant Extension and became a watershed restoration specialist on the Eastern Shore, where she works with local governments and groups on stormwater management. Dindinger and her watershed restoration specialist colleagues participate in a partnership program between the University of Maryland Extension, Maryland Department of Natural Resources, and Maryland Sea Grant, which jointly support them. She helped start the Watershed Stewards Academy (WSA) in Cecil County, which offers extensive training for individuals who want to learn to install small-scale, best stormwater-management practices in their communities. Some participants pursue careers in landscaping, while others hope to improve water quality close to home. The Cecil WSA, one of about a half dozen in Maryland, recently welcomed its third cohort. Dindinger also helped the planner for the city of Cambridge win grants to finish installing stormwater controls on Maryland Avenue, a major thoroughfare through the historic district. And she’s pushed for restoration using native plants, too. As a watershed specialist, she sometimes finds it hard to point to tangible results; so much of the work, Dindinger said, involves making connections and helping organizations secure this grant or that technical help. It can take years before those connections translate into work on the ground. But if she had to pick a favorite project, she said, it might be the Trinity Parish rain garden in Church Creek, which she helped plan with the Nanticoke Watershed Alliance. Dindinger assisted a member of the Chesapeake Conservation Corps — a service organization for college graduates, who work with an environmental or science organization — with the garden design. Then she worked with a Girl Scout troop to paint rain barrels. Dindinger is not sure where she’d be if Brinsfield had not answered the phone. She’s just glad he did. It’s been an interesting career so far, with more good work to come. “We [extension specialists] call ourselves the grease, the catalyst for things,” she said. “We may not be the one wielding the shovel, but we help bring everyone together.